We’re back again, finishing our sixth collection to date: the Lang Collection! After a year-and-a-half of adventuring through the General Reserve Collection (you can read about some of the highlights in our two-part blog), this one was over almost before it began – the tiny collection of uncatalogued Lang books took the Lighting the Past team only three and a half days to complete. Consisting of 139 bibliographic records and 179 item records, our efforts guided us through the ins and outs of this small but fascinating collection. Many of the items we catalogued had the suffix ‘(RLG)’ after the classmark. This indicates that they were donated by Roger Lancelyn Green, an Oxford academic and children’s writer. Green was a friend of many of the members of the literary discussion group the Inklings, such as J. R. R. Tolkien and C. S. Lewis, of whom he was a former student and biographer. Green also wrote a biography of Lang under Tolkien for his BLitt thesis, published in 1944, among many other later biographies of his favourite childhood authors. Born in 1844, Andrew Lang was a well-known Scottish poet and novelist. He contributed significantly to the realms of fairy stories, history, and anthropology. Probably most renowned for his 12 ”Coloured” Fairy Books, Lang left St Andrews in 1863 to study at Glasgow. 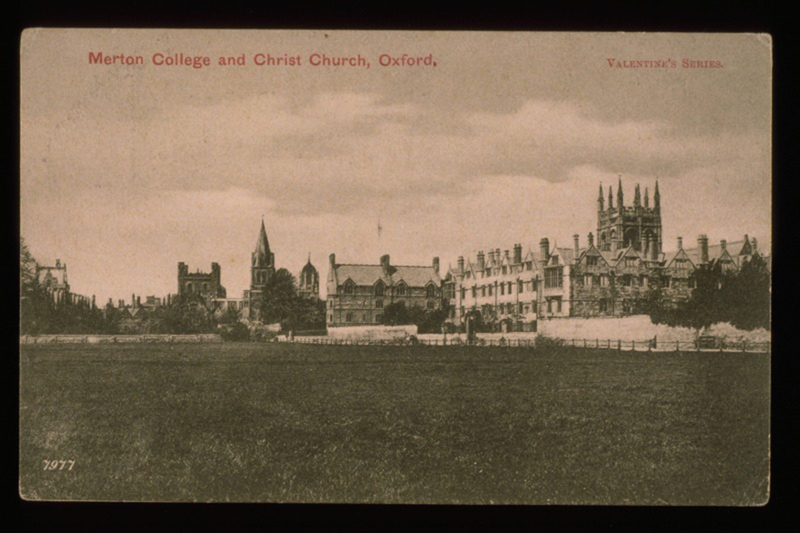 Thereafter he went to Balliol College, Oxford until 1868, proving himself throughout his academic career to be a talented and versatile writer. The Oxford Dictionary of National Biography notes that ‘he took firsts in classical moderations in 1866, literae humaniores in 1868,’ and later he ‘was elected to an open fellowship at Merton College’. 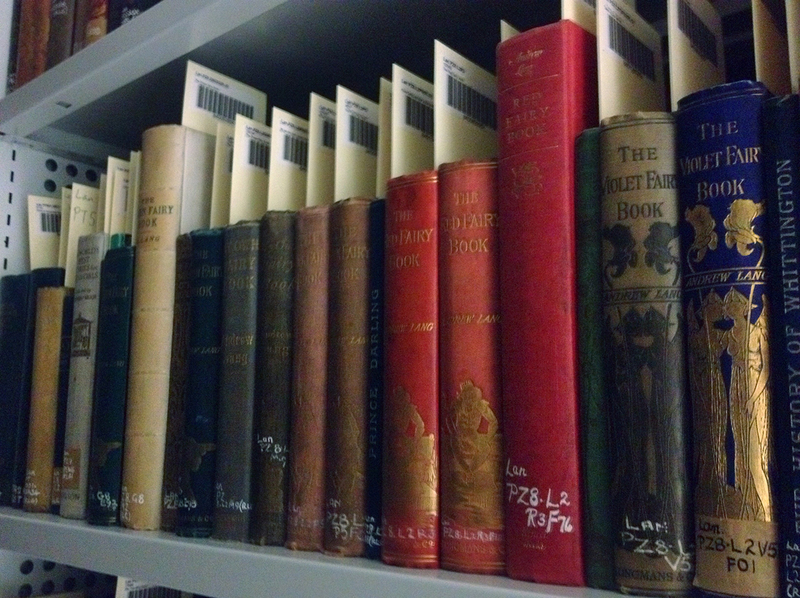 A small selection of Andrew Lang’s Coloured Fairy Books from the University’s Lang Collection. 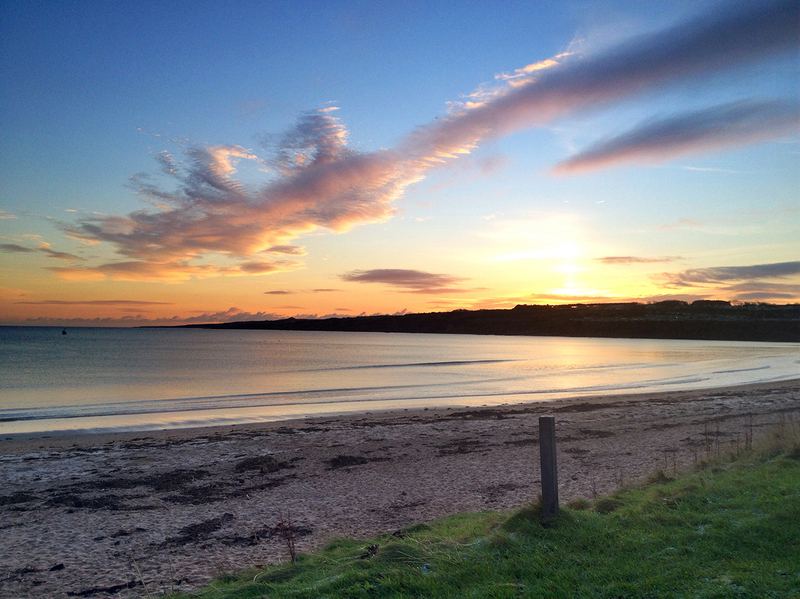 The sun rises over East Sands, St Andrews on a December morning. It’s not difficult to see why Lang thought so highly of the town, especially in winter! Richard Dorson wrote a fascinating article called Andrew Lang’s Folklore Interests As Revealed in “At the Sign of the Ship” in the Western Folklore journal, detailing, as the name suggests, Lang’s specific focuses in the study of folklore (particularly, “to study the national character in traditional tales”). Additionally, Charles Falconer provides an insightful glimpse into Lang’s literary studies with his Catalogue of a library chiefly the writings of Andrew Lang, which is rather extensive (including many tomes on folklore, ballades and poetry), encompassing some 495 titles which Lang wrote, edited, or contributed to! In addition, amongst the University’s Manuscript holdings can be found the Lang manuscript collection, containing, for example, a large collection of letters from Lang to members of his family, many manuscripts written by Lang for a variety of occasions, and several personally annotated copies of his printed works. As we move on to works that Lang himself penned, we have The Adventures of Odysseus, translated by Lang and illustrated by Joan Kiddell-Monroe. Published as part of ‘The Children’s Illustrated Classics’ series in 1962, this is one of the multitudes of editions of Lang’s translated works, reprinted and republished by different editors, attesting to the continued popularity of his work. 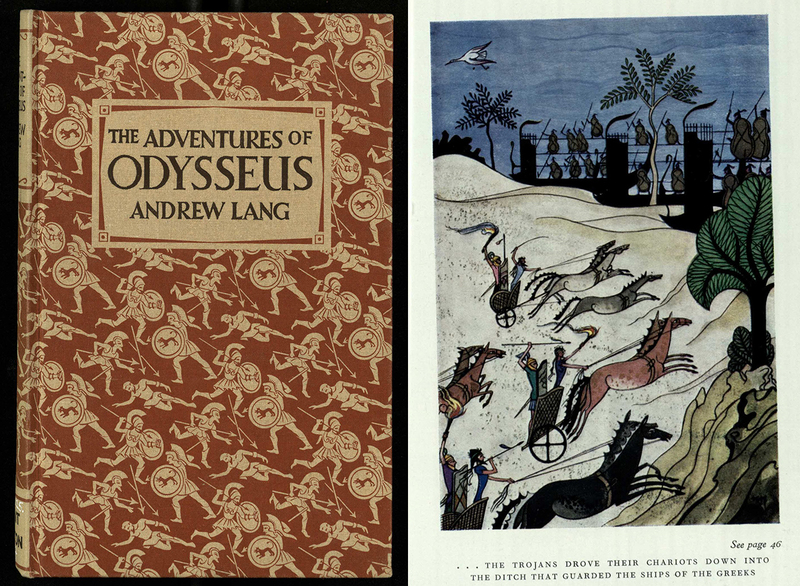 Left: the beautiful front cover of The Adventures of Odysseus (Lan PA4025.Z3L2(RLG) ), translated by Andrew Lang. Right: one of the four colour illustrations completed for the book by Joan Kiddell-Monroe. This scene depicts the Trojan charge against the Greek landing party on the beaches before Troy. I mentioned previously Lang’s 12 Coloured Fairy Books – and one item that showcases tales from many of the books simultaneously is the Fifty Favourite Fairy Tales, collected by Kathleen Lines and illustrated by Margery Gill. Many classics are represented here, from Hansel and Gretel to Rapunzel, and Snow-White and Rose-Red to The Ratcatcher, illustrating the extensive collection of different and varied fairy stories that Lang gathered together. 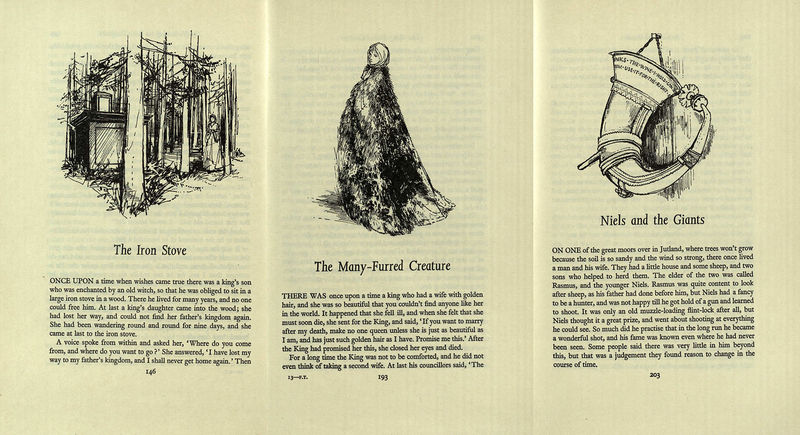 Illustrations for Fifty Favourite Fairy Tales (Lan PR4876.F5L5) From left to right: The Iron Stove from the Yellow Fairy Book, The Many Furred Creature from the Green Fairy Book, and the drinking horn from Niels and the Giant in the Crimson Fairy Book. 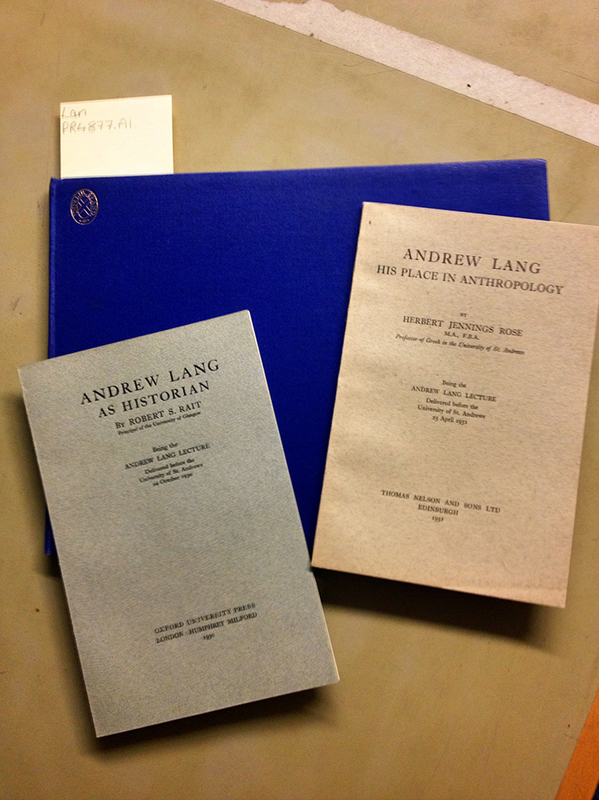 Though they might look dull, these three selections from the Andrew Lang lectures contain exciting and vibrant descriptions of Andrew Lang, his role as a Historian and Anthropologist, and indeed the joy and necessity of Fairy Stories themselves. 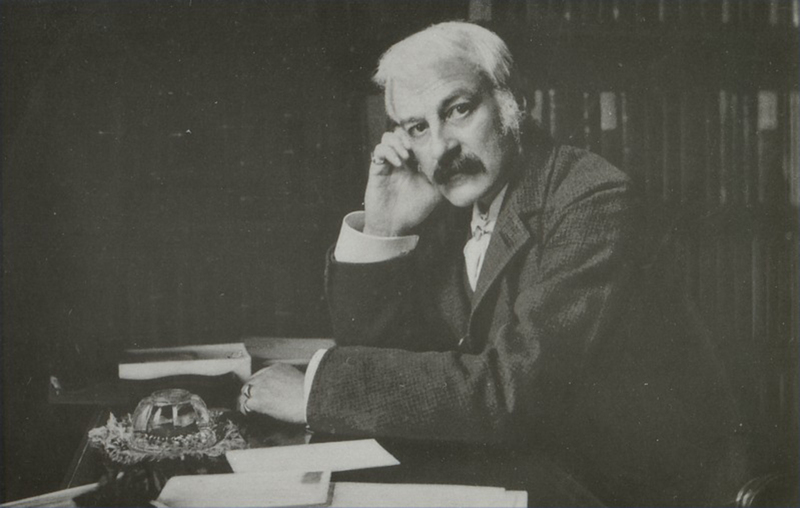 From left to right: Andrew Lang as Historian (Lan PR4877.A1), On Fairy Stories (Lan PR4877.A1), and Andrew Lang His Place in Anthropology (Lan PR4877.A1). By far and away the most famous lecture from this series is J. R. R. Tolkien’s ‘Fairy Stories’, given as the 1939 lecture. It was first printed, with some revision and enhancement, in 1947, under the title On Fairy Stories in the festschrift volume of Essays Presented to Charles Williams, one of Tolkien’s fellow Inklings. It subsequently was reprinted in Tree and Leaf, alongside the story ‘Leaf by Niggle’ which exemplifies the essay; later editions of this work also include Tolkien’s seminal poem ‘Mythopoeia’. Tolkien’s essay is a real delight to read, and should you find yourself more curious about the links between Tolkien and the University, readers should consider perusing Rachel Hart’s excellent article, ‘Tolkien, St Andrews, and Dragons’, in Tree of Tales. Two beautiful full colour illustrations from Andrew Lang’s Coloured Fairy Books. 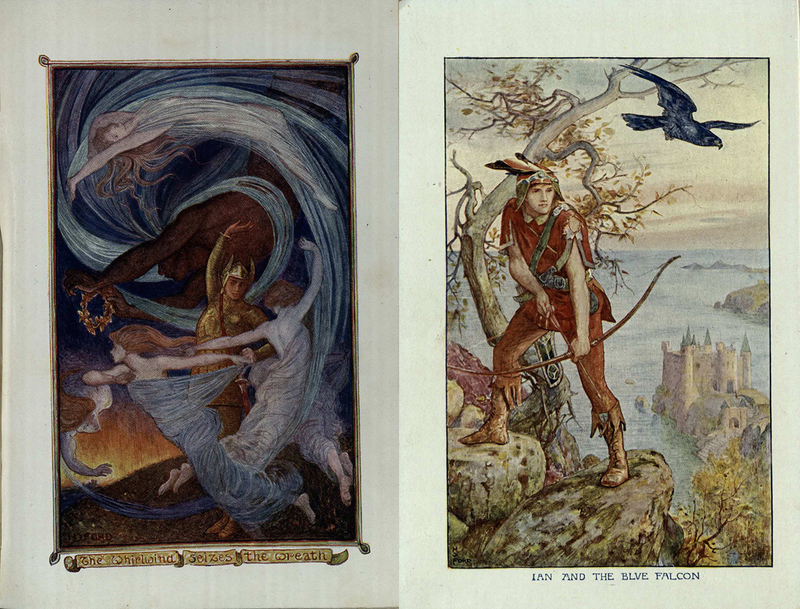 Left: ‘The whirlwind seizes the wreath’, from The Fairy of the Dawn in the Violet Fairy Book. Right: ‘Ian and the Blue Falcon’, from the story by the same name in the Orange Fairy Book. The Lang Collection is a small but utterly captivating collection, with countless forays into the worth and value of the imagination and stories. Andrew Lang stands as a testament to the importance of folklore and fairy tales in our lives, and this collection echoes that time and time again. It was a joy to work with. I love the Lang coloured Fairy books. I do not have the originals but I managed to obtain kindle versions! I really enjoyed this piece about Lang. Thanks so much. The Lang Collection looks to be a very interesting and diverse collection of books and other materials. What an interesting individual he was! Although I’m American, I have a Scottish heritage and I enjoy reading about Scotland and it’s people. As a former head of a rare book and manuscript department in a university library, I appreciate and applaud your efforts! Many thanks for reading and for your lovely comment!